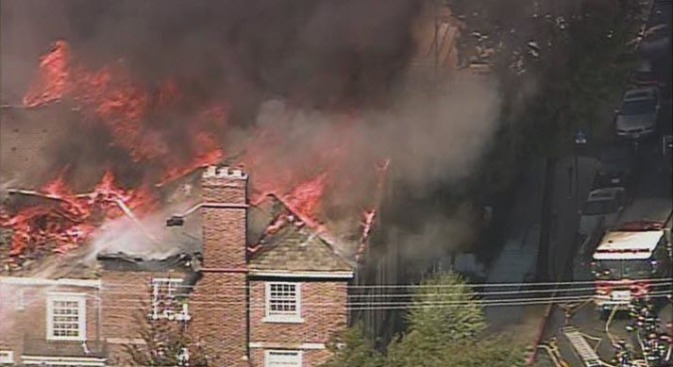 A fire so intense it collapsed a roof raged at an iconic Berkeley church on Friday afternoon. The four-alarm fire broke out at 12:30 p.m. at the First Congregational Church of Berkeley, a church and building that has played a significant role in the history of the city. The building currently located at 2345 Channing Way was erected in 1925 and was designed by Bay Area architect Horace G. Simpson, according to the book Berkeley Walks: Revealing Rambles through America's Most Intriguing City. It is the third building of worship for the church and was built in the period revival style, meant to evoke the architecture of early New England churches, according to local historian Steve Finacom. The congregationalist church movement began in New England in the 17th century. According to its website, the Berkeley congregationalist church was founded on December 1, 1874. It was formed after then University of California President Daniel Gilman issued a call during his inaugural address for moral and religious institutions to build halls near the university. "What church, what association, what individual will be the first to establish such a hall?" he asked. The First Congregational Church of Berkeley answered that call. The church's first chapel was located on the southeast corner of Telegraph Avenue and Dwight Way in Berkeley. A second church was built on the northeast corner of Dana Street and Durant Street in 1884. The current church sits on the northwest corner of Dana Street and Channing Way. Finacom also pointed to the the church's historical significance during the internment of Japanese Americans in the 1940s. When Berkeley's Japanese-American residents were ordered to report to a local fire station to be processed for internment, Finacom said the First Congregational Church of Berkeley stepped in. The church welcomed the residents to come to its church instead, where congregants could provide hospitality as the Japanese-American residents were processed by the U.S. Army. "It was a wonderfully beautiful thing that the church did," Finacom said. "It's been a progressive church ever since." The hall where those residents were cared for, Pilgrim Hall, is in the part of the building destroyed by Friday's fire, Finacom added. Finacom said a different fire in the 1970s destroyed part of the church's north wing, but that area of the building was eventually rebuilt.